In last year’s November Surprise, the Justice and Development Party (or AKP) solidified its position at the helm of Turkey’s ship, capitalizing on its supposed proven economic track record and firm stance in the face of separatist terrorism. The country is now still being led by the dynamic duo of Tayyip Erdoğan and Davutoğlu, respectively Turkey’s President (or Prez) and wily PM (or Wily). Both men appear more determined than ever to enforce their vision of Turkey’s future, as a country once again ruled by charismatic strongmen and united in its devotion to Sunni Islam. 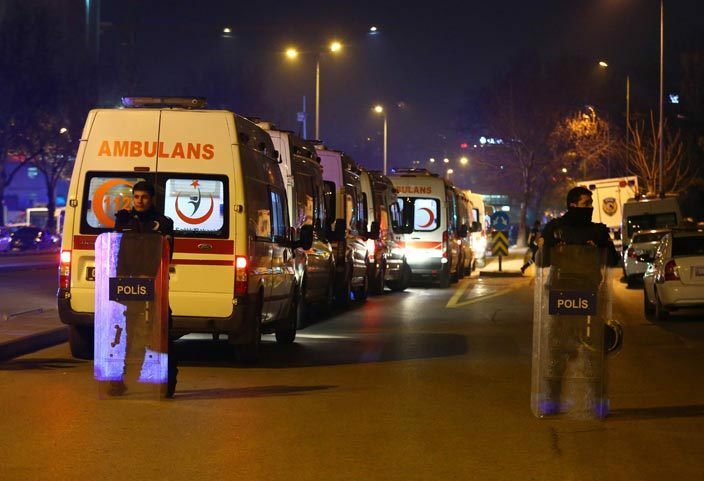 But now Kurdish suicide bombers (or terrorists, if you will) have twice struck Turkey’s capital Ankara in quick succession (on 17 February and 13 March 2016, respectively). The authorities immediately associated these two deadly attacks with the names of the PKK (Partiya Karkerên Kurdistanê or Kurdistan Workers’ Party), active in Turkey, and the PYD (Partiya Yekîtiya Demokrat or Democratic Union Party), active in Syria. In this way, the AKP-led government seemed to acknowledge the existence of a causal link between the terrorist attacks and its military operations in the South-East of the country that have been continuing for many months now. The official rationale behind these fierce military operations is the Turkish state’s desire to bring an end to the armed struggle with Kurdish separatists, a struggle whose beginnings hark back to the 1980s and that was actually in the process of a peaceful resolution when the ceasefire was brought to a sudden end following the supposedly inconclusive June 2015 elections. These operations amount to veritable exercises in collective punishment and have been described as “a vicious offensive against Kurdish citizens over the last eight months” by the West Yorkshire-based writer, poet and teacher employing the pseudonym Ed Sykes. The Beyoğlu Blast: The Civil War moves West or a Caliphal Intervention?!?? And now terrorism has struck at the cultural and commercial heart of the country, as a “[s]uicide bomber kills four, wounds 36 in Istanbul shopping district,” on Saturday, 19 March 2016, as reported by the news agency Reuters. This audacious act hit the famous İstiklal Caddesi (or Independence Avenue), a pedestrian mall in the now-fashionable district of Beyoğlu, adjacent to the by now world-famous Taksim Square, and home to many brand name outlets as well as being a cultural hub in its own right, a hub where many locals and foreigners alike congregate and spend money: “Turkish media said three Israelis and one Iranian were killed, while two of the Israelis were also named by Washington as US citizens.” The fact that this suicide attack came quickly after the latest Ankara blast could lead to the conclusion that the spectre of a “civil war” in Turkey is now slowly turning into a reality, a new reality that has the country’s Kurds, or rather separatist or terrorist organizations of Kurdish provenance fight the AKP-led government of the country in an all-out guerilla campaign that takes no prisoners and kills civilians and soldiers, citizens and foreigners alike. But, as was the case with the seemingly random suicide attack on the Hippodrome in Istanbul’s tourist district of Sultanahmet last January, the authorities swiftly dismissed any Kurdish link and instead pointed the finger at Abu Bakr al-Baghdadi and his Islamic State (or ISIS). And, as has become the Turkish norm by now, the authorities imposed a media blackout, so that journalistic investigation all but turned to speculation and conspiracy-mongering, leaving the official narrative intact and unquestioned. By means of DNA evidence the Turkish authorities have since quickly identified the Beyoğlu suicide bomber as a young man named Mehmet Öztürk, whom the media now describe as an “ISIS militant.” The security forces have now also taken Öztürk’s father and brother into custody. Turkey’s Interior Minister Efkan Ala has told the press that “[t]he available information indicates a link with the terror group [known as] Daesh [or ISIS or the IS]. Whether other links and other powers were behind [the attack] is a topic for investigation. There is no search record available on the person [in question].” In other words, the appearance of Mehmet Öztürk as a caliphal operative active in Turkey is basically a matter of conjecture. Other terror acts perpetrated by ISIS in other locations are usually followed by some kind of subsequent claim of responsibility. But in Turkey, ISIS terror tends to remain unclaimed. For instance, the spectacular Brussels attacks of 22 March, that quickly succeeded the Beyoğlu blast, were claimed in due time. This “coordinated terror attack,” claiming the lives of at least 31 victims, in addition to the two suicide bombers, was subsequently owned by the Islamic State (or ISIS/Daesh), attributing its execution to a “security group from the soldiers of the caliphate,” before issuing a severe threat: “What is coming is worse and more bitter, God permitting.” In the same way, following the Sultanahmet attack, the IS carried out an attack on the Indonesian capital of Jakarta, executed by at “least five militants.” These actions were also immediately claimed by the terror group previously known as ISIS via the services of the Amaq News Agency, which openly supports the Caliph and his IS. In contrast, both supposed IS-orchestrated Istanbul attacks (12 January and 19 March 2016) remained unclaimed, which did not stop the Turkish authorities from accusing the Caliph and his henchmen. On the other hand, the Ankara attacks have clearly shown that Kurdish terrorists are now equally capable of deploying suicide commandos though their ideological belief system does not hold the promise of 72 virgins in the afterlife. Instead, the TAK is now operating on the same wavelength as the erstwhile Tamil Tigers in Sri Lanka (or LTTE, meaning Liberation Tigers of Tamil Eelam). According to the Military Guide to Terrorism in the Twenty-First Century, prepared under the direction of the U.S. Army Training and Doctrine Command, the “LTTE ha[d] a suicide unit, The Black Panthers [consisting] of both men and women that direct[ed] their attacks primarily against senior government and military personnel. Between July 1987 and February 2000, the LTTE carried out approximately 168 suicide attacks in Sri Lanka and India killing and wounding thousands of innocent bystanders.” Today the LTTE have ceased to exist, as the Sri Lankan government smashed the group militarily in March 2009. Even though the LTTE was “the most effective and brutal organization to utilize this form of terrorism,” Turkey’s PKK has in time also resorted to this tactic. The Senior Research Fellow at Israel’s Institute for National Security Studies (INSS) Yoram Schweitzer relates that the “PKK has carried out a total of 21 suicide attacks or attempted attacks (15 attacks were actually carried out and 6 were intercepted). Its suicide campaign started on 30 June 1996 and ceased on 5 July 1999 at the decision of its leader Abdullah Öcalan [in captivity since 15 February 1999]. This terror campaign caused relatively low casualties: 19 were killed and 138 were wounded.” But now, the TAK, as the only Kurdish group to claim publicly that it is continuing a bloody terror campaign against the Turkish state, has apparently decided to continue this relatively short-lived PKK tactic. And, it seems, the TAK is more effective in its execution of suicide missions, apparently following in the footsteps of the LTTE. And in this context, it is interesting and ominous to read in the Military Guide to Terrorism in the Twenty-First Century that the Tamil Tigers were “the only organization that succeeded in assassinating two heads of states. Former Prime Minister of India Rajiv Gandhi was killed in May 1991 by a female suicide bomber and Sri Lanka President Prendesa was killed in 1993 by a male suicide bomber.” The LTTE’s ideological superstructure was also based upon the principles of geographical separatism and (Tamil) nationalism, as the Tamil Tigers fought for the “oppressed Tamil people” in order to save them from the “chauvinist Sinhala regime,” in place on the island of Sri Lanka, as expressed by the Tamil extremist Fr. Emmanuel, S.J. Could these things now mean that the Kurdistan Freedom Falcons have decided to become a Turkish version of the Liberation Tigers of Tamil Eelam?? And should the Prez and Wily now start worrying seriously about their own safety?? The Turkish state has effectively been at war in the south-eastern part of Anatolia’s territory for many months now. Even though casual observers might think that sheer and unadulterated nationalism lies behind the fighting, the reality on the ground proves quite different. It seems that the AKP leadership’s promises of continued stability induced a great majority of the voting public to cast their ballots in favour of the PM Ahmed Davutoğlu and President Erdoğan. As such, some would even argue that the sudden breakdown of the ceasefire with the PKK and the discontinuation of the Kurdish Peace Process were directly linked to the AKP’s election campaign and Erdoğan’s grand-standing, trying to prove that he alone would be able to unite and pacify the nation. That the Prez and his AKP would be able to unite and pacify the country as a nation of believers, firmly dedicated to Sunni Islam able to supersede mere ethnic or national ties and solidarity. The notorious Islamophobic director of the Middle East Forum Daniel Pipes rightly points out that the dynamic duo Erdogan-Davutoglu’s dangerous gamble has now brought the country “to the point that civil war has become a real prospect.” As a result, I would argue that the Turkish government has now taken compete control of the nation’s news’ media in order to propagate its own narrative. The message being driven home now is that AKP-led Ankara is doing all it can to bring peace and tranquility to the South-East, but is somehow being outsmarted by foreign players. such as Abu Bakr al-Baghdadi and his IS. And that the spectre of civil war is nothing but a chimera, a fancyful fantasy that does not fit into Turkey’s AKP narrative . . . the Prez himself has after all declared last year that “[i]f there are [people] who are expecting a civil war, then they belong to a network of treason. Treason.” And in this way, in Turkey, reality gives way to faith . . . faith in the figure of Tayyip Erdoğan and his ability to shape the Turkish narrative in his own image.